Is the greeting used in India, with the hands folded together in prayer. 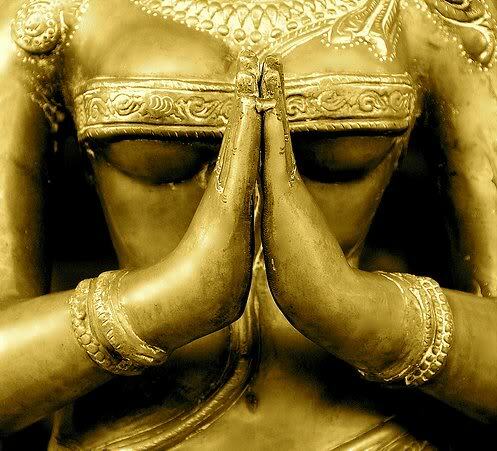 Namaste literally means " The god in me bows to and acknowledges the god in you." 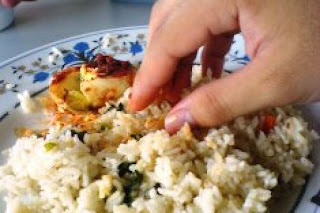 In India, as in all across Asia, people eat with their RIGHT HAND. This is because the left hand is used for unclean tasks. To eat with your right hand, only take as much as you can easily fit into your mouth in one bite. To eat from or to pass food with your left hand is considered unclean. If you want to share food with others, there are strict rules. Indians will not accept food that has been touched by others lips. So if you want to share your food, offer it before you begin to eat or take small portions from a larger dish. If you share water or drinks from a common container then your lips should also not touch the container. 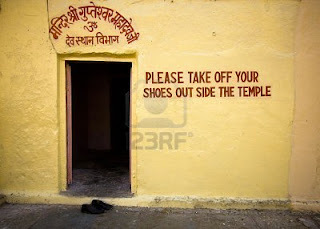 Shoes should be removed before entering temples or mosques. There are usually places available to leave your shoes for a small fee, some temples offer foot wear to protect your feet from the heat of the stones. Mosques are open to visit except at prayer times. it is not considered polite to take photographs inside temples. Sikh temples require visitors heads to be covered and will supply cloths for this purpose. Indian people are quite conservative about dress and most Indians dress quite formally even on holiday. Women do not wear clothes that reveal the body shape (for example, jeans with a long top are acceptable but cut off jeans with skimpy top are not). Men are advised to wear a shirt at all times. Kissing and embracing in public is not acceptable behaviour in public places in India, even holding hands in some less toursity places is considered scandalous. When entering someone's home, remove your shoes. When sitting, pointing the soles of your feet towards anyone is considered rude. Sitting cross legged avoids this potential social gaffe. Do not point or touch anyone with your feet, if you do so by accident then this is always followed by an apology. India has a few challenges for a woman traveler. While Indian women face the daily problem of sexual harassment (known as Eve Teasing), Western women are not excluded from this problem. Staring, brushing into your body bits and or grabbing them are all feats of the North Indian Eve Teaser. Walk with your body bits protected or covered at all times and do not be afraid to return any unwelcome touch with a punch or a slap.